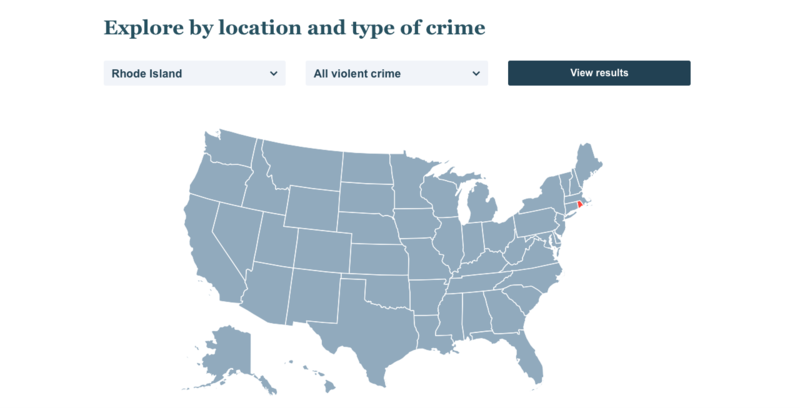 The FBI wants to make national crime data more accessible, and the recently released Crime Data Explorer, built in partnership with 18F, is the agency’s latest attempt at this goal. The interest isn’t new — decades ago it led to the creation of the Uniform Crime Reporting Project, which the bureau was tasked with collecting data for in 1930. But modern technology enables better reporting and more transparency than UCR’s standard yearly reports. And so, in the fall of 2016, the FBI began building the Crime Data Explorer. “The Crime Data Explorer is part of the FBI’s broader effort to modernize the reporting of national crime data,” the site, still under development, states. The FBI worked with the General Services Administration’s 18F tech shop to build a comprehensive tool — users can view crime trends across the country, by state and by variety of crime; they also can tap into the crime data API and even download the raw data sets. “The goal of the project was to build an intuitive, user-friendly tool, and in turn, improve accessibility of the FBI’s crime data,” 18F product manager Larry Bafundo told FedScoop. Above and beyond the technical challenges, the 18F team also had to decide how to build something useful and intuitive. Hence the responsive map and trend view capacity. There are some limitations to the data — for some states it is more in depth than for others, and the trend view only goes back as far at 1995. Also, the only crimes included in the data set are reported crimes. “The FBI plans continued development of the tool based on ongoing user and stakeholder feedback, and expects to add more recent data and new features in the near future,” he said.